One of four people identified thus far as having died in a private plane crash on April 9 in Scottsdale, Ariz., was Mariah Sunshine Coogan, a resident of West Hollywood. 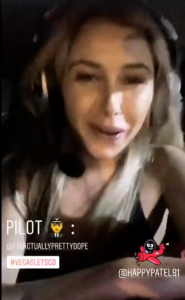 Image from Mariah Sunshine Coogan’s video of herself on the flight from Scottsdale. HollywoodLife, the celebrity gossip site, reports that Coogan, 23, was flying to Las Vegas with several young friends, who also were killed. Three of them, including Coogan, are said to be “Instagram celebrities” because of their large following on that website. Coogan is known on Instagram as mariahsunshiinee, and has 31,300 followers. Just before the crash, Coogan took a video of herself and fellow passengers, including Anand “Happy” Patel, 26, who also had a large Instagram following. The Federal Transportation Administration is looking into the cause of the crash, and it appears that James Pedroza, the 28-year-old pilot, did not have a pilot’s license. Coogan’s family has set up a Go Fund Me account to raise money to support animal causes. So much to offer this world, and gone, but not forgotten! So sad! You can see such passion in her eyes! Very sad! My heart goes out to her, and I actually think I saw something about her before, maybe on film? Something about this driven girl, (looking much like her, who made umpteen trips to take kitties to shelters that would have died. Could that be one and the same? I think she was a pilot too.) Anyway, my condolences and I really hope her dreams can be furthered by others in respects to her and her family, and to protect her fur babies. Such a beautiful girl with so much life left to live. A huge tragedy for her family, and all the people and animals she would have helped. My prayers are with her family. God Bless.